West Virginia Northern Community College marked its 40th anniversary year this week by honoring the past and celebrating the future during a special event featuring its founding president, Dr. Daniel B. Crowder. Crowder was the main speaker at a Thursday luncheon during which invited guests, including several former colleagues of the first president, heard about the early days of the college along with being given a short update on expansion projects currently under way on the Wheeling campus. The audience, which included many long-time supporters of the WVNCC Foundation, also learned of a new initiative, the Crowder Legacy Society, which honors the founding president by giving donors in his name an exclusive way to remember WVNCC in their wills. “West Virginia Northern is extremely pleased that former President Crowder and his wife, Wreatha, were able to join us for our anniversary commemoration,” Dr. Martin J. Olshinsky, current president, said. “They shared memories with us and we were able to bring them up to date on what’s new at our three campuses. It has been a special week,” he added. Crowder cited early leaders of the college, including two members of that first presidential search committee who attended the special luncheon at the college’s Culinary Arts Dining Room in the Education Center. They are Bill Deibert, retired Northern faculty member, and Jerry Halverson, one of only two emeritus members of the Foundation with the other one being Crowder. Also attending the luncheon were Dr. David Perkins and Dr. Greg Adkins who served in academic capacities in Crowder’s presidency as well as current or former faculty and staff members Regina Jennette, Rita Yeager, Bonnie Ellis, Donna Smittle, Jack Cisney, Rita Malek, Ralph Lucki, Robert “Zac” Wycherley, Willa Knollinger and Rebecca Yesenczki. 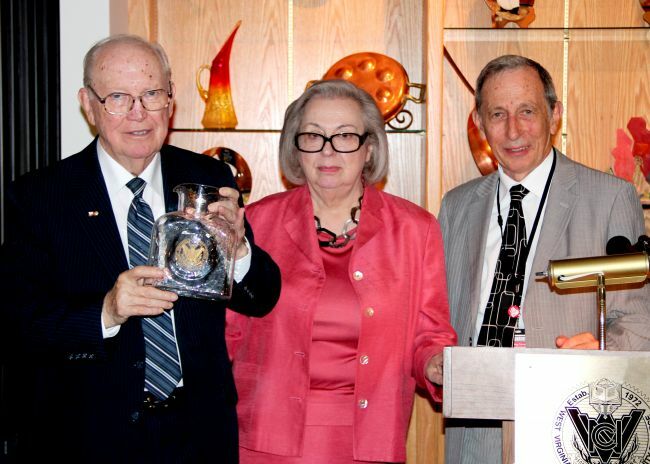 As the first member of the Crowder Legacy Society, Crowder was given a Blenko Glass pitcher engraved with the college seal, a memento that will be given to all subsequent enrollees. According to Olshinsky, donors informing the college that they’ve made a charitable gift in their wills for WVNCC will be enrolled in the Crowder Legacy Society. A gift of $25,000 or more will enable the donor to name a fund. Crowder was president from 1972-85; he and Wreatha are residents of Florida. He has authored several books during his more than 40 years in education. He served as executive director of the Florida Association of Colleges and Universities, an adjunct professor at Florida International University and Florida Atlantic University, regents professor of history at West Virginia College of Graduate Studies, director of the division of social science at Miami-Dade Community College’s south campus, and a public school teacher in Florida’s Dade County and in Arcadia, Calif.
Crowder holds a bachelor of science, master of arts and a doctorate, all from Ball State University in Muncie, Ind. West Virginia Northern Community College was created by action of the former West Virginia Board of Regents on May 9, 1972, which became effective July 1, 1972. The college was created from the former Hancock County Branch and the Wheeling campus of West Liberty State College. The college first was located in east Wheeling in the Hazel-Atlas Building, which was home of the former West Liberty campus. The B & O Building was added in 1975. Opened in summer of 2006 is the Education Center in a renovated warehouse building across Chapline Street from the B & O. The Wheeling campus is expanding once again with current renovation and construction of the former Straub Honda buildings on Market Street across from the B & O. In Weirton, classes first were offered at Weir High School during the evenings. By 1975, the college acquired land and modular buildings in Weirton. The first phase of a permanent instructional facility was constructed in 1982, with the second phase to replace the modular buildings constructed in 1999-2000. An addition to that building was opened in early 2012. In the fall of 1972, the college made arrangements for offering its first courses in New Martinsville in the spring of 1973. A campus was established in New Martinsville in 1975 in a renovated downtown discount store, which was replaced with the permanent facility in 1990.